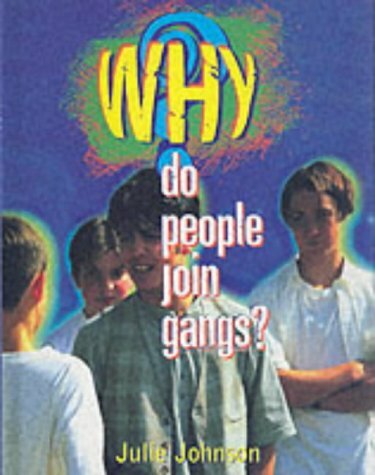 Johnson is a consultant in education for personal and social development, and this is a title in a new series which seeks to answer why people do potentially anti-social things like drink alcohol, take drugs and gamble. I can see this book having a place as an aid to discussions with young adults in schools or youth clubs. However, the question is a difficult one to answer simply. Part of the difficulty comes from Johnson's wide definition of gangs, which includes playground bullies, the Mafia and the Ku Klux Klan. Johnson is properly concerned with what they have in common, particularly the use of violence and intimidation, but perhaps does not distinguish clearly enough between informal patterns of everyday bullying and gangs organised with criminal or political intentions. The connections that she makes, between what her readers will have seen on the news and in films, and what they will have experienced in their own lives, would perhaps work better in open discussion. This is a well-organised and produced book but it doesn't quite come together. The photographs of Los Angeles street gangs, Neo-Nazi thugs and scenes from The Godfather contrast sharply with the posed scenes of teenage actors illustrating the more mundane reality of bullying. It includes a helpful list of organisations, further reading and resources.